Scientists fear that ballast water carried by ships is providing a vehicle to bring in exotic invasive species across the Indian Coast. A recent survey conducted by the Department of Aquatic Biology and Fisheries, University of Kerala, had recorded the presence of as many as 10 invasive species in the biodiversity-rich intertidal habitats of the Kerala coast. They include one seaweed, one species of bryozoan, one species of mollusc and seven species of ascidian. The expansion of seaports and minor ports is paving path for the arrival of invasive species in coastal areas. The survey says that heavy loads of ballast water carried by ships could transport fish, viruses, bacteria, algae, zooplankton and benthonic invertebrates to harbours at a faster pace. Sea slug called Winged Thecacera ( Thecacera Pennigera ) which were originally reported from the Atlantic coast of Europe, are currently reported from South Africa, West Africa, Pakistan, Japan, Brazil, eastern Australia and New Zealand. The sea slug were also found in the southwest coast of India. Ballast is a compartment in a ship that provides it stability as it holds water which moves in and out of it to balance the ship. The compartment usually remains below the water level in order to counteract the weight above the water level. In the nineteenth century, cargo boats returning from Europe to North America would carry quarried stone as ballast, contributing to the architectural heritage of some east coast cities, where this stone was used in building. ⇒ Ballast water is one of the biggest transporters of non-native marine species. Studies done by experts have indicated that over 10,000 marine species are being transported across the world in ballast water carried by ocean-going vessels for stability and safety. 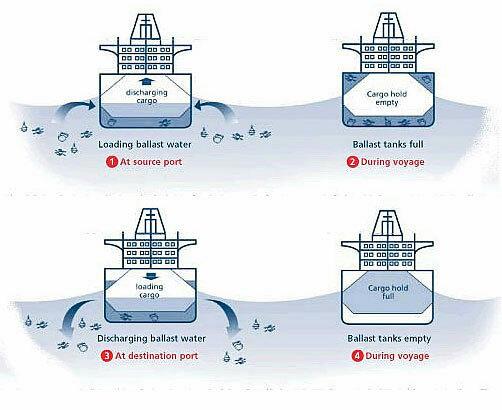 Ballast water is discharged when the ship enters a new port, releasing alien organisms into the local waters. ⇒ Very few of the invasive species establish a cordial relationship in their newfound homes, but those that do have the potential to adjust themselves, survive in the new enviornment by preying on local species or competing with them for food and habitat space. Ballast water is also considered a vehicle for toxic algae causing red tides and harmful algal blooms. Every person shall be a citizen of India who has migrated from Pakistan to India before ........ and since then have been ordinarily residing in India. Fill in the blanks with correct option?